Camden's Dublin Castle Pub will be given a prestigious award today - by iconic band Madness. The British ska group will present the Dublin Castle's owners with a PRS for Music Heritage Award to celebrate the fact that the venue gave them their first gig over 40 years ago. A man has died in a fire at a flat in north London after 21 firefighters battled to save him. 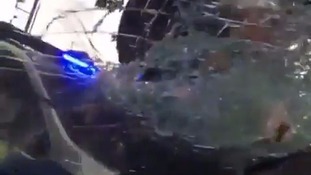 The officer is seen attacking the car with a baton and what looks like a pen knife completely shattering the glass. 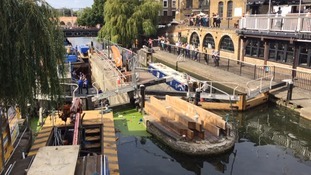 A first look into a drained Camden Lock canal has uncovered a gun and coins ahead of a planned silent disco event in the new space. A handgun has been found in Camden lock after it was drained. A 76-year-old man and 34-year-old woman have been arrested on suspicion of murdering a woman in Camden. Police have released a photo of Camden stabbing victim Romeo Nkansah in an appeal for witnesses. Detectives have launched a murder investigation following a stabbing in Camden. Entrepreneurial builder from Highgate looks to rent or sell his toliet for £3,000 a month after spotting a gap in the market.